PeRL studies autonomous navigation and mapping for mobile robots in a priori unknown environments. 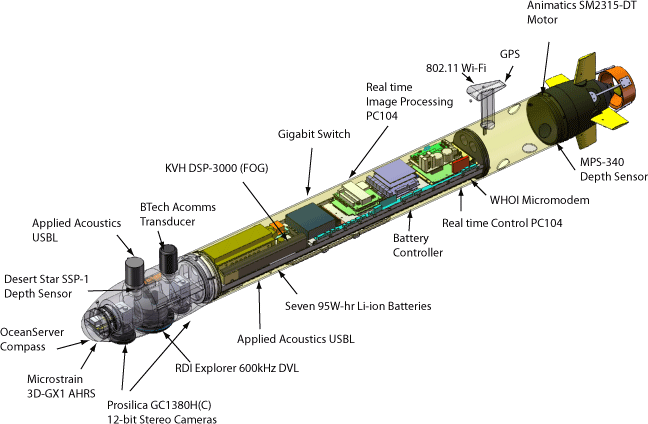 PeRL's multi-AUV testbed is based upon a modified Ocean-Server Iver2 AUV platform. Shown in the foreground is a modified vehicle displaying a new nose cone designed and fabricated by PeRL. For comparison, shown in the background is a stock vehicle displaying the original nose cone. Video of the vehicle being tested at the University of Michigan`s Marine Hydrodynamics Laboratory (MHL) Physical Model Basin. In this test, the vehicle was rigidly fixed to the moving carriage and towed the length of the tank to measure hydrodynamic parameters. The combined result is a decentralized navigation methodology that provides inter-nodal ranging and data sharing among heterogeneous nodes over a spectrum of spatial scales. 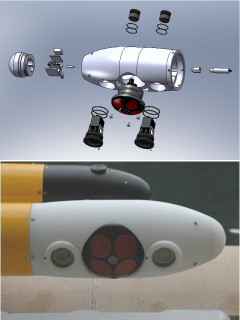 The goal is to improve the localization and mapping ability of disparate platforms by leveraging the perception and localization capability of neighboring vehicles via a (low-bandwidth) distributed estimation framework � thus, improving the precision and scale of robotic mapping in ocean science. Exploded view of PeRL's custom nose cone housing DVL, stereo cameras, WHOI modem, Desert-Star pressure sensor, and Microstrain AHRS. Field Experimentation The Iver2 platform was chosen (and modified) to serve as a convenient, cost-effective platform for research, development, and experimental validation of vehicle control systems and navigation techniques. PeRL has teamed up with the NOAA Thunder Bay National Marine Sanctuary to use these experimental vehicles to perform exploratory navigation and mapping in the Great Lakes. Two levels of mapping granularity will be provided with these vehicle platforms: (1) large-area survey coverage via sidescan sonar from mid-water column surveys, and (2) high-resolution optical imaging surveys from near-bottom surveys. These complementary sensing scales will allow for large-area searches of new wrecks in and around the proposed expansion of Sanctuary borders, while the high-resolution optical surveys will provide visual confirmation of acoustic targets. Modified Iver2 sensor and attributes table.